Before returning to New Bordeaux – and unleashing his vengeance against the Italian Mob – Lincoln Clay had a hard tour in Vietnam. Mafia III: Plain of Jars (Insight Publishing), a novelized prequel to the events in Mafia III, takes you in-country with Lincoln. See how he operated in the field… and how his CIA handler, John Donovan, became such a close and trusted ally. Written by Jeff Mariotte and Marsheila (Marcy) Rockwell, the book tells of Lincoln’s secret mission to take down a communist warlord on the edge of the legendary Plain of Jars in Laos. Here’s a quick excerpt from the book – after Lincoln’s first op with Donovan. Slight spoiler warnings for what’s ahead. Lincoln’s wounds had been minimal, so he had gone with the search party. Heading back to the camp from the last drop, Lincoln felt a nudge on his shoulder. He turned to see the CIA agent there, one eyebrow raised in a quizzical expression. “Take a walk with me?” the man said. Lincoln couldn’t think of anything to say to that, so he simply nodded. “Sometimes, sacrifices have to be made for the greater good,” the agent continued. “No real loss, the way I see it,” Lincoln said. The agent chuckled. “Exactly. The guy was a scumbag, through and through. The agent stopped, so Lincoln did, too. “My name’s John Donovan,” the man said. “That’s pretty clear,” Lincoln admitted. and blew out a long ribbon of smoke. 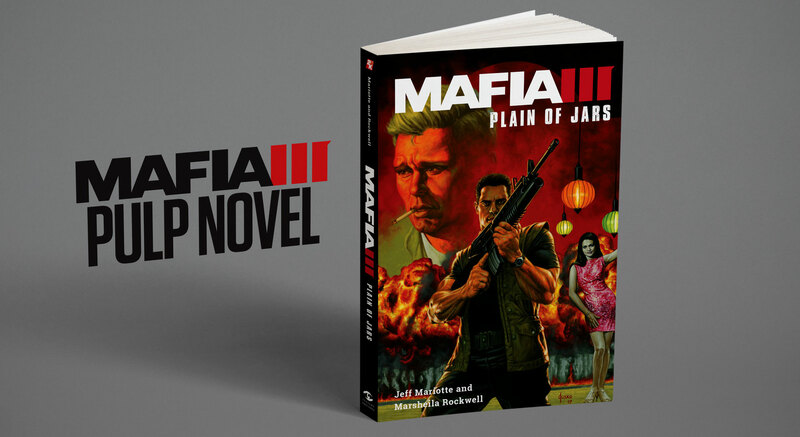 Mafia III: Plain of Jars is now available for $15.99 through Insight Editions, Amazon, Barnes & Noble Booksellers and Indie Bound. © 2016 TAKE-TWO INTERACTIVE SOFTWARE И ЕЕ ДОЧЕРНИЕ КОМПАНИИ. РАЗРАБОТЧИК: HANGAR 13. 2K, HANGAR 13, 2K CZECH, ЛОГОТИП 2K, ЛОГОТИП 2K CZECH, ЛОГОТИП HANGAR 13 И TAKE-TWO INTERACTIVE SOFTWARE ЯВЛЯЮТСЯ ТОВАРНЫМИ ЗНАКАМИ И/ИЛИ ЗАРЕГИСТРИРОВАННЫМИ ТОВАРНЫМИ ЗНАКАМИ TAKE-TWO INTERACTIVE SOFTWARE. ЛОГОТИП СЕМЕЙСТВА "PS" ЯВЛЯЕТСЯ ЗАРЕГИСТРИРОВАННЫМ ТОВАРНЫМ ЗНАКОМ, А "PS4" - ТОВАРНЫМ ЗНАКОМ SONY INTERACTIVE ENTERTAINMENT INC. ЗНАЧОК ВОЗРАСТНОГО РЕЙТИНГА ЯВЛЯЕТСЯ ТОВАРНЫМ ЗНАКОМ ENTERTAINMENT SOFTWARE ASSOCIATION. ВСЕ ПРАВА ЗАЩИЩЕНЫ.